Figure 1. The San Diego Marine Life Refuge houses several distinct habitats, including kelp beds, rocky reefs, sandy flats, and canyon areas. further scientific understanding of these unique and special marine habitats. Both the reserve and refuge represent "the place" in San Diego where divers, snorkelers, swimmers, and kayakers go to enjoy abundant flora and fauna, including lobsters, abalone, crabs, trigger fish, giant kelp fish, schools of leopard sharks, sea turtles, and hosts of other species of fish and aquatic life. Seals have also established a rookery near the reserve. Because of its high level of use, proximity to a heavily urbanized area, and irreplaceable biological species and habitat, this marine environment is vulnerable to impacts from human activities. It is critical that those using these areas and living within the watershed understand their role in protecting it and that protection efforts are assessed to measure effectiveness. 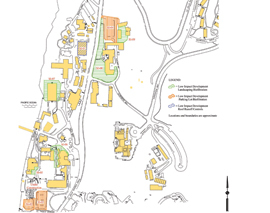 The University of California, San Diego (UCSD) campus and the city of San Diego are adjacent in the watershed, and their urban runoff commingles as it drains into the two ASBS. 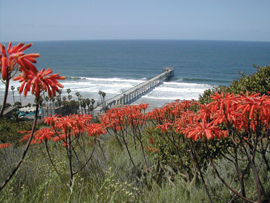 As part of a comprehensive watershed approach, the project partners (city of San Diego, San Diego Coastkeeper, and UCSD) developed the La Jolla Shores Coastal Watershed Management Plan (LJCWMP) in 2007. The LJCWMP is the blueprint for actions taken locally to protect and improve water quality in these ASBS offshore of La Jolla Shores. This collaborative watershed plan outlines strategies for ASBS protection, including urban runoff management, ecosystem assessment, information management, and public participation. 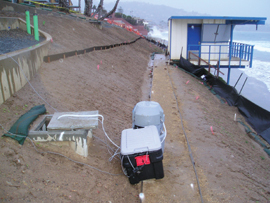 In 2007, UCSD received a grant through the state of California to implement management measures (MMs) and best management practices (BMPs) to ensure the long-term protection of water quality along the La Jolla Shores coastline by reducing potential pollutant discharges into these ASBS. MMs are intended to protect coastal waters from urban sources of nonpoint-source pollution, and BMPs are the structural and nonstructural solutions to reduce or eliminate pollutants of potential concern from storm water and urban runoff. These pollutants were identified based on site characterization studies, sampling and analysis of urban runoff, and a study of select marine life to determine what if any impact constituent concentrations in the ocean had on certain biomarkers. The pollutants of concern were further characterized for treatability based on the results of samples analyzed for total and dissolved metal fractions and grain size. 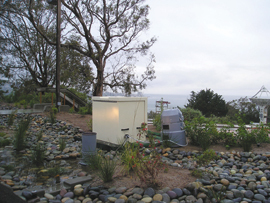 As a result of the state grant, UCSD constructed BMPs to reduce pollutants of potential concern. BMPs included treatment controls (mixed-media embankment filters) to reduce sediment, metals, organics, bacteria and oil and grease (O&G) in stormwater; various source controls (wash racks; trash enclosure pollution controls; material storage area controls; and restoration, erosion, and sediment controls); five dry-weather diversions to eliminate non-stormwater discharges to the ASBS that could include organics; and decentralized low-impact-development (LID) projects to reduce non-stormwater and stormwater discharges (Figures 2 through 4). A seawater discharge treatment system for Birch Aquarium is also planned to prevent non-indigenous species from entering the ASBS. Characteristics of the BMPs selected included, among others, the ability to operate passively during storm events; have well-understood, defined, and relatively low long-term maintenance requirements; integrate aesthetically into the surrounding environment; and provide significant removal of target pollutants of concern and pollutant loading reductions. Other key project benefits have included 1) demonstrating to other ASBS dischargers how to meet the ASBS waste discharge prohibitions, 2) illustrating to watershed planners and managers the advantage of collaborative watershed efforts, and 3) educating the local and regional communities about the precious shoreline resource, and empowering these communities to protect this special biological area. Another important aspect of the grant was to demonstrate the effectiveness of the MMs and BMPs in reducing pollutant discharges and impacts of urban runoff to the ASBS and marine life. This was done through a paired watershed study and monitoring the performance of the proposed BMPs after construction to determine actual load reductions and lifecycle costs (operation and maintenance costs). The method for conducting BMP performance monitoring and calculating load reductions followed those recommended in EPA's 2002 Urban Stormwater BMP Performance Monitoring. Figure 2. Various LID features, such as bioswales and infiltration beds shown in green and red, were installed throughout the watershed. The actual calculation of load reductions was based on influent and effluent BMP effectiveness monitoring and paired watershed monitoring. Influent and effluent BMP effectiveness calculations followed the procedures of the effluent probability method. Additionally, total and dissolved metals were assessed to determine the relative load from different sources, and particle size distribution was evaluated to interpret the ability of a BMP to remove suspended materials. Paired watershed monitoring followed procedures found in EPA's Handbook for Developing Watershed Plans to Restore and Protect our Waters. Assessments of changes in ambient receiving water quality after the BMPs are implemented use the results of ongoing testing being conducted under existing National Pollutant Discharge Elimination System (NPDES) permit requirements and the LJCWMP. Water-quality and flow monitoring were conducted at the influent and effluent of two mixed media embankment filters to assess stormwater pollutant load reductions. Adapted from the Washington State Department of Transportation's ecology embankment design, the mixed-media embankment filters constructed at UCSD are composed of a gravel layer and a mix of dolomite, gypsum, and perlite to provide removals of both particulate and dissolved fractions of metals (Figure 3). Automated flow measurement and sample collection devices were used to collect flow-weighted composite samples and the average flow rate each minute during the sampling event. To determine long-term load reductions, the effluent probability method was used. To arrive at a percent reduction number, the method begins by calculating the product of the measured flow volume and the constituent concentration of each sample event at the influent and effluent to the BMP. The next step is to sum the individual event loads to determine a total mass of the pollutant for each influent and effluent. The effluent mass is divided by the influent mass and converted to a percentage representing the efficiency of the BMP at removing the given pollutant. For example, seven samples and corresponding flow measurements were collected at the small mixed-media embankment filter over a period of two years (2009–2011). 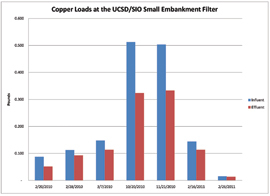 The influent and effluent loads of copper for each sample are plotted in Figure 5. A paired watershed study requires data collection at two monitoring locations, a treatment and a control, during two time periods, calibration and treatment. The treatment and control locations are not expected to be identical, but they are assumed to respond predictably and in a similar fashion to the BMPs under consideration. For example, two parking lots at the Scripps Institution of Oceanography were selected as treatment and control locations to study the performance of a bioswale and various restoration projects and erosion controls at removing sediment and associated parking lot pollutants. The lots are not identically sized, but were constructed in a similar manner and experience proportionally similar traffic. During the calibration phase, samples were collected prior to BMP implementation to establish a statistical relationship between the locations. Once this relationship was established, BMPs were implemented at the treatment location. Samples were again collected at both locations. The effluent probability method described above was used to determine the effectiveness of the BMPs by comparing the results from the two phases at the treatment location only. Then the relationship between the two locations was recalculated. Using statistics, the relationships were compared and the change in the relationship could be established with an associated confidence level. Thus, two measures are used to determine the effectiveness of the BMPs: the direct load reduction at the treatment location calculated by the effluent probability method, and the improvement of the runoff compared to the control location using the paired watershed approach. The paired watershed approach eliminates bias resulting from changing conditions within the study area, such as traffic or weather, and allows for identifying trends in water quality more rapidly than traditional end-of-pipe trend analysis. The goal of the dry-weather flow diversion is to eliminate the discharge of non-stormwater to the ASBS. The target of the program is to divert runoff from 95% of the land within the study area, for a result of 95% diversion of dry-weather flows. Five diversion structures were constructed. Three primary methods of evaluating the effectiveness of the diversions were employed. First, outfalls were observed after implementation during dry weather, and flow, if any, was noted. Second, automated flow measuring equipment was installed to continuously monitor for flow over a one-month period. Finally, GIS was used delineate the portion of the study area that was diverted. As an example of the first two methods of evaluation, a dry-weather diversion structure was constructed to eliminate dry-weather flows from outfall 1, which is one of the facility's two primary beach outfalls (Figure 6). The structure consists of an underground chamber that intercepts wet- and dry-weather flows to outfall 1. A berm at the bottom of the structure diverts low flows to a gravel infiltration bed. Higher flows from wet weather crest the berm and discharge to outfall 1. Post-construction observations and flow monitoring of the structure indicated that it successfully diverted and infiltrated dry-weather flows it received. Through the implementation and monitoring of MMs and BMPs, such as the mixed-media embankment filters and decentralized LID features, improvements in urban runoff have been measured since construction was completed in 2010. Effectiveness monitoring has demonstrated significant removals of potential pollutants of concern, and ambient receiving water monitoring has shown improvements in the ASBS water quality. Figure 6. 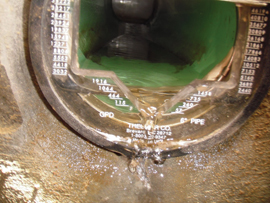 Flow rates into the diversion chamber for outfall 1 were monitored using a Thel-Mar weir. Continued holistic watershed management, targeted effectiveness monitoring of MMs and BMPs, and linking these efforts to improvements in the overall health of the ecosystem are key not only to ensuring that La Jolla and San Diego can continue to enjoy the many benefits that this unique marine environment offers in the future, but also to ensuring that scarce budget dollars are focused on sustaining the vital aquatic ecosystems and thriving marine life in these ASBS. Author's Bio: Nathan Schaedler is a senior principal engineer for AMEC's San Diego office. Author's Bio: Matt Rich is a project manager for AMEC's San Diego office. Author's Bio: KimberlyO'Connell is an environmental specialist with the University of California, San Diego, Environment, Health and Safety Department.